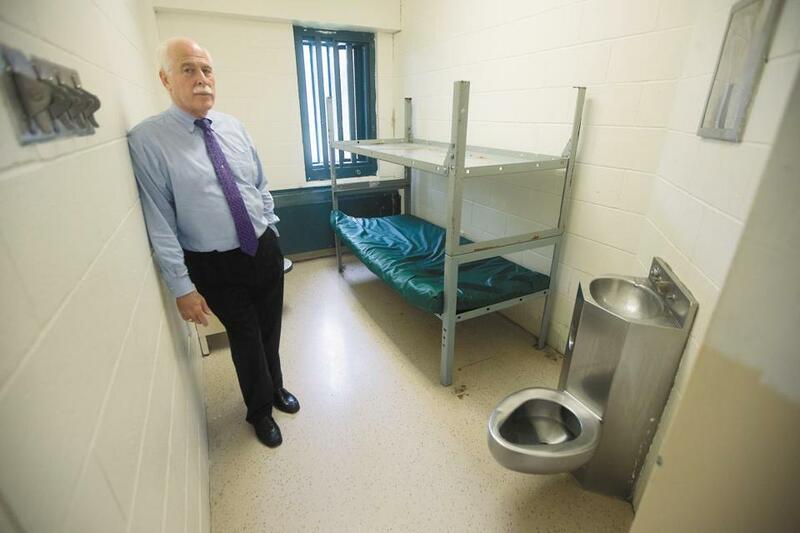 Bristol County Sheriff Thomas Hodgson inspects a 7x 10 foot cell in the Bristol County House of Correction. 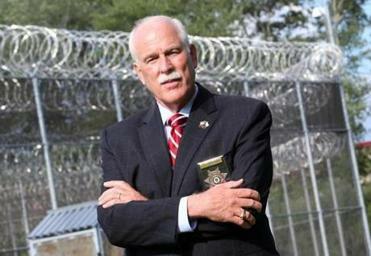 Bristol County Sheriff Thomas M. Hodgson has hit on a new idea to mistreat the inmates he’s been elected to rehabilitate: deprive them of in-person family visits. If that seems too cruel to be true, take note that this is the same sheriff who infamously volunteered his prisoners as free labor to build President Trump’s mythical border wall. But Hodgson’s latest volley against prisoner rights is not merely an act of empty political showmanship. He’s nearly finished installing the video equipment that would replace in-person family visits for about 900 of the 1,500 inmates under his control. It gets worse: Ultimately, the plan is to charge families for a video connection to see and speak with their incarcerated loved ones. Already many groups, including the ACLU of Massachusetts and the Prison Policy Initiative, are protesting the video-calls plan. Substituting video for in-person visits is not only inhumane; it’s also a bad policy that has backfired at jails across the country. Research shows that banning in-person visitation increases recidivism. A 2014 report in Texas found that smuggling and disciplinary cases actually increased in Travis County when Skype-like calls were implemented. Shortly after, the Texas legislature passed a law allowing video calls in jails only to supplement in-person visits. In January, Massachusetts lawmakers introduced two bills that would prevent substituting in-person visitation with any electronic form of communication for inmate visits. Hodgson claims the move is rooted in safety concerns and cost-saving. At Bristol County jails, visitors are separated by clear plexiglass from inmates, and must use a phone to talk. The sheriff has said drug and gun smuggling have been a problem during these visits. If that’s the case — and it’s unclear how the contraband got through plexiglass — better searches seem like a more sensible solution. Hodgson, who signed a contract with Texas-based Securus for the video-call system, told WCVB he will save between $30,000 to $60,000 a year with the new policy. Republican lawmakers brought forward a state bill that would allow local law officials to arrest people wanted solely for immigration violations. Under the plan, video-conferencing with inmates on-site will be free for their relatives, but a remote option will not. If families want to connect using a webcam at home, they will have to pay anywhere from $5 to $20 for a 15-minute video call — with the sheriff’s office taking a commission. “This is the picture the sheriff has in mind: I will save money by not having as many guards, while I earn some money off the backs of poor families,” said Jim Pingeon, director of litigation at the nonprofit Prison Legal Services. But Bristol County, and the Commonwealth, should take the hint from the states that have tried such a short-sighted strategy. In-person family visits should be encouraged at Massachusetts prisons — not replaced with such a poor substitute.